The Industry’s premier Solvent Recycling System is portable, easy-to-use, and affordable..
- Actual distillation -- not filtration. - No troublesome and noisy vacuum pump. - Can be operated 24 hours a day. - Use on multiple parts cleaners. - Small footprint for your shop. - Reused solvents boost your ROI. - Clean, pure solvent available constantly. 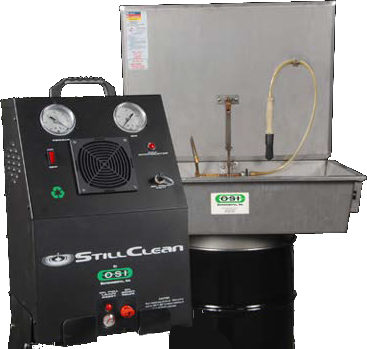 - Eliminate solvent service costs. - Slash hazardous waste disposal. - Lower your environmental liability. - Simple onsite recycling process.